[12/2018] Prof. Atrey appeared on NPR (WAMC) - Academic Minutes and talked about a new way to fight fake news. To listen, click here. [12/2018] Prof. Atrey received Plaque of Appreciation on completing 10 years of service on the editorial board of ETRI Journal. Click here for photo. [11/2018]: Prof. Atrey was appointed as Vice Chair (America Region) for the IEEE MMTC Communication Reviews. 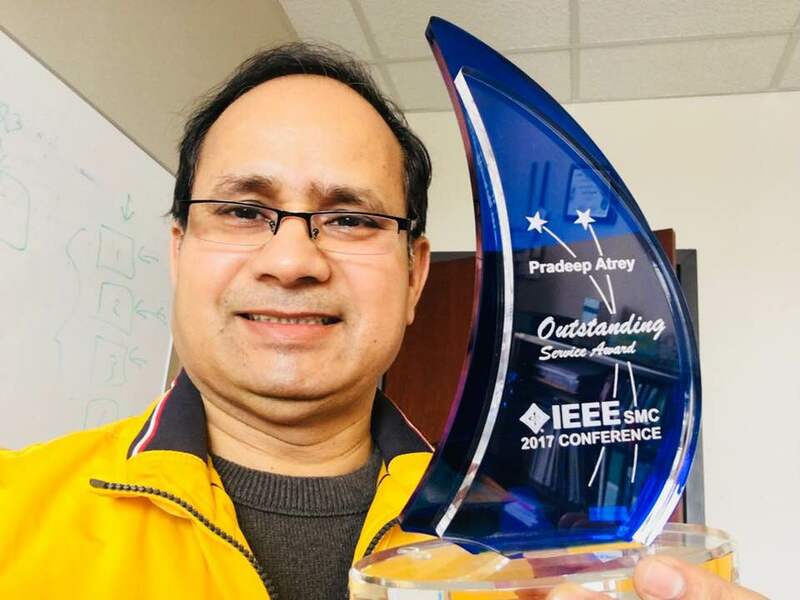 [02/2018]: Award: Prof. Atrey received Outstanding Service Award for his professional service for the 2017 IEEE SMC Conference. Click here for photo. [02/2018]: Media Coverage: Prof. Atrey was featured in UAlbany News "Protect Yourself: February is Data Privacy Month, a Good Reminder to Check Your Online Security" offering his advice on identity theft protection. [07/2018] UAlbany News: Prof. Atrey and his student Vikram Patil were featured in UAlbany News "A Safer Way to Share Your Location" featuring their recent work on GPS location privacy. [01/2018]: Prof. Atrey was honored as the Chief Guest at the NetSec'18 event conducted at Indian Institute of Technology (IIT) Roorkee, where he delivered the valedictory and keynote talk. For past news, click here. My research focuses on security and privacy of i) people and ii) people's data. The former includes design and development of automated multimedia surveillance tools and techniques (e.g. automated video surveillance) balancing the two contradictory goals of keeping people safe and preserving their privacy. The latter deals with encrypted domain processing, cleaning, editing, searching and deduplication of multimedia data; web phishing detection, malicious browser extension detection, and web authentication; fake content (e.g. fake news) identification and forensics for various cyber world applications. - [12/2018] NPR (WAMC) - Academic Minutes: Prof. Atrey appeared on NPR (WAMC) - Academic Minutes and talked about a new way to fight fake news. To listen, click "here". - [07/2018] UAlbany News: Prof. Atrey and his student Vikram Patil were featured in UAlbany News "A Safer Way to Share Your Location" featuring their recent work on GPS location privacy. - [06/2018] UAlbany News: Prof. Atrey and his student Shivam Parikh were featured in UAlbany News "Fake News Detector" featuring their recent work on fake news detection research. - [02/2018] Experian: Prof. Atrey offered his insight in an article "Fighting Back Against Tax ID Fraud" on experian.com, about the importance of keeping different passwords for different accounts. - [02/2018] UAlbany News: Prof. Atrey was featured in UAlbany News "Protect Yourself: February is Data Privacy Month, a Good Reminder to Check Your Online Security" offering his advice on identity theft protection. - [08/2017] BYU Radio: Prof. Atrey appeared on the Matt Townsend show of BYU Radio and talked about modern ATM security. Here is the interview. - [06/2017] The Conversation US: Prof. Atrey weighs in on security issues and concerns of modern ATMs as they turn fifty. Read his article in The Conversation US. - [02/2017] Fox News Fox News runs story quoting Pradeep Atrey on "How AI fights the war against fake news". - [06/2016] Times Union Prof. Atrey emphasizes the importance of teaching computer science to children at early stage in an article titled Class is key to cracking the code published in Times Union. - Plaque of Appreciation on completing 10 years of service on the editorial board of ETRI Journal. Click here for photo. - P. K. Atrey, B. Trehan and M. K. Saini. Watch Me from Distance (WMD): A privacy-preserving long-distance video surveillance system. ACM Transactions on Multimedia Computing Communications and Applications (TOMM) (Accepted February 2019). - P. Singh and P. K. Atrey. Recovering tampered regions in encrypted video using POB number system. Elsevier Signal Processing: Image Communication, 74:96-109 (2019). - S. Parikh, V. Patil, R. Makawana and P. K. Atrey. Towards impact scoring of fake news. The 2nd IEEE Workshop on Fake Multimedia (FakeMM'19) with the IEEE International Conference on Multimedia Information Processing and Retrieval (MIPR'2019), San Jose, CA, USA, March 2019. - S. Parikh, V. Patil and P. K. Atrey. On the origin, proliferation and tone of fake news. The 2nd IEEE International Conference on Multimedia Information Processing and Retrieval (MIPR'2019), San Jose, CA, USA, March 2019. - M. Shah, M. Mohanty and P. K. Atrey. SecureCSearch: Secure searching in PDF over untrusted cloud servers. The 2nd IEEE International Conference on Multimedia Information Processing and Retrieval (MIPR'2019), San Jose, CA, USA, March 2019. - A. C. Pasera, V. Patil, and P. K. Atrey. Secured computing of GPS trajectory similarity: a review. The 2nd ACM SIGSPATIAL Workshop on Recommendations for Location-based Services and Social Networks (LocalRec'2018), Seattle, WA, USA, November 2018. - Q. Huang, V. K.Singh and P. K. Atrey. On cyberbullying incidents and underlying online social relationships. Springer Journal of Computational Social Science. Volume 1, Issue 2, pp 241-260 (2018). - G. Varshney, M. Misra and P. K. Atrey. Secure authentication scheme to thwart RT MITM, CR MITM and malicious browser extension based phishing attacks. Elsevier Journal of Information Security and Applications, Vol. 42, pp 1-17 (2018). - Associate Editor, ACM Trans. on Multimedia Computing, Communications and Applications (TOMM). - Associate Editor, Elsevier Signal Processing: Image Communication Journal. - Vice Chair (America), IEEE Communications Society, MMTC Comm Reviews. - Associate Editor, IGI International Journal of Digital Crime and Forensics (IJDCF). - Workshop Co-Chair, The 2nd IEEE International Conference on Multimedia Information Processing and Retrieval (MIPR'19), March 2019, San Jose, CA, USA. - Area Chair, The 2nd IEEE International Conference on Multimedia Information Processing and Retrieval (MIPR'19), March 2019, San Jose, CA, USA. - Symposium Co-Chair, Multimedia Computing and Communications Symposium, IEEE ICNC 2019 (MCC'19), February 2019, Honolulu, Hawaii, USA. Last updated: February 23, 2019. You are visitor no.